Chances are you’re not like me, though. But there are a lot of you out there looking down at your favorite games and wondering how you can make them even better – and not just the games themselves, but the entire gameplay experience overall. In today’s Top 6 we tackle that challenge. Here we present to you our Top 6 ways to spark joy in your board gaming experience. For organizational purposes, I’ve tried to list these in ascending order from the least expensive to the most expensive. When it comes to vehicle maintenance, we don’t hesitate when it’s time for an oil change and we don’t balk at replacing the tires when they’re getting worn down. Much like an automobile, your board game collection represents a significant financial investment and this is even more true as your collection grows. It’s no wonder you’d want to protect it to ensure that it, too, lasts for a long, long time. Not too long ago, Kurt Refling penned an article talking about different ways to protect your board game collection from things like wear, sunlight, and moisture. In addition to the protective methods he already laid out, we can think of a few more things that could be useful and won’t cost you an arm and a leg. One of the best bangs for your buck towards improving your game experience is sleeving the cards in your games. Not only does this help them hold up longer, but it also looks and feels better too. There are a lot of companies out there manufacturing card sleeves but we recommend giving companies like Ultimate Guard, Ultra Pro,or KMC a try. Their card sleeves are very high quality and they also offer large varieties of different shapes and sizes as well. Ultra Pro has been around for quite awhile. Their cards sleeves are thick, sturdy, and durable. 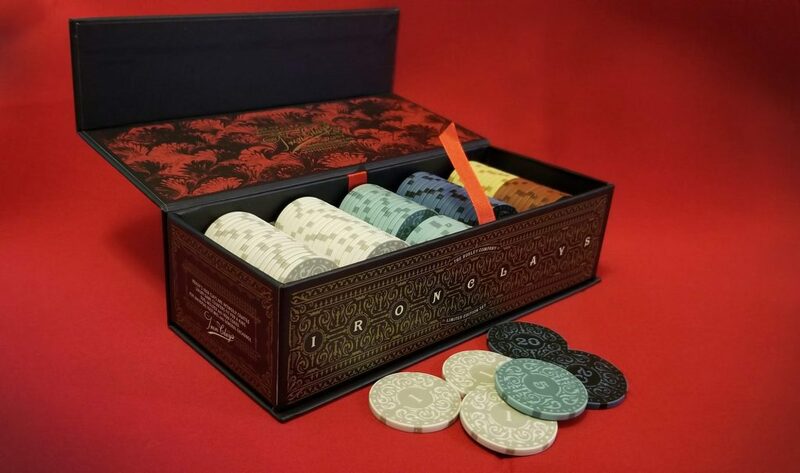 Once a company focused solely on collectible card games, they have since branched out into other avenues and now offer a wide assortment of shapes and sizes. Like Ultra Pro, Ultimate Guard also offers a wide assortment of different shapes, sizes, and qualities at competitive prices. Ultimate Guard was kind enough to send us some samples and they’re amazing. We can see these sleeves lasting us for a very long time to come. The problem with most card sleeves, though, is that there is usually a little bit of overhang on the edges and after a lot of vigorous shuffling, these edges can catch on each other causing the sleeves to tear. KMC has a solution to this issue in their line of Perfect Fit sleeves. Originally intended to sleeve cards which are then placed into other sleeves for card collecting purposes, the Perfect Fit sleeves function perfectly fine as sleeves in their own right and have zero overlap. Add in the fact that you can purchase around 600 of these sleeves for just under twenty bucks and you’ve got a winning combination. Next, if you’re banding your cards together with rubber bands, you’re doing yourself a disservice. Not only do rubber bands put a lot of unequal pressure onto particular parts of your cards, but over time, they can dry rot, break, and stick to your cards as well. If the rubber bands are colored, they can even leech dye into your cards. 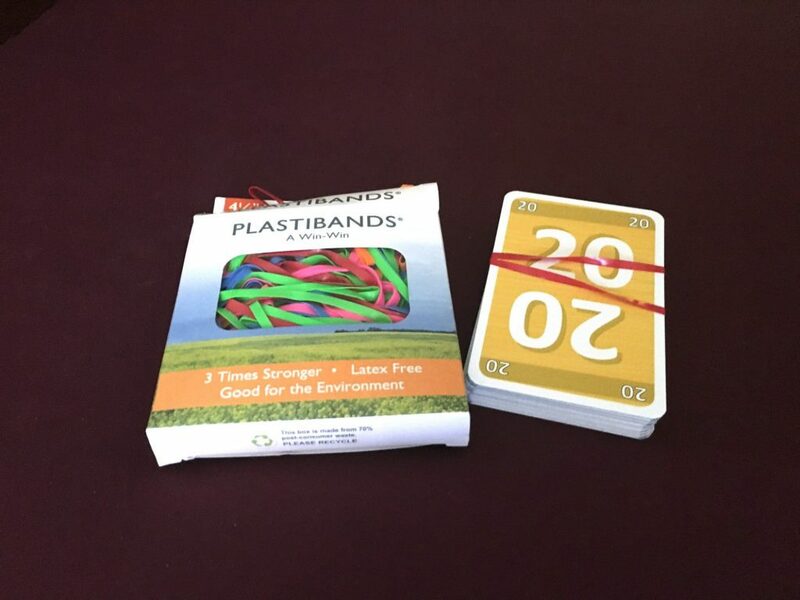 Instead of banding your cards together with rubber bands, we recommend using something like Plastibands instead. For your other components, we find that the simplest solution is most often the best solution – plastic baggies. These come in wide ranges of shapes and sizes and they’re fairly cheap. You can usually pick up several hundred of them for under $10 online or from any craft store. Typing “plastic baggies” into Amazon, for instance, will show you multiple options to choose from. Not only do these help to protect your components, but they’re excellent for organizational purposes as well. Are you tired of cheap cardboard currency? Do you find it difficult to get drawn in by colored cubes? Do you relish the feel of cold, hard coinage in your hands? Would you prefer your wheat to actually look like wheat? Fortunately, there’s an entire board gaming aftermarket specifically for these types of things! The Broken Token – this company offers a broad spectrum of game upgrades. In fact, they will appear in this list multiple times. In terms of metal coins, they offer a variety, from coins designed for specific games to more generic coinage designed to fit specific themes (i.e. – Ancient Greece or Vikings). They sell each coin pack for around $6, but the quantity of coins in a specific pack is dependent on the size of the coins themselves. Meeplesource – this company, much like The Broken Token, also offers a wide array of game upgrades and will also appear in this list multiple times. As far as metal currency goes, they do not offer quite as wide an array as The Broken Token, but they do offer quite a few and they have very high production value. For instance, their coins for Scythe look amazing. Top Shelf Gamer – while not as well known, this company definitely has a lot to offer as well and is worth taking a look. Like The Broken Token, most of their coin packs sell for around $6 each. But unlike The Broken Token, each of Top Shelf Gamer’s $6 coin packs contain exactly 10 coins regardless of their shapes and sizes. This company sells other game upgrades as well including inserts, resource upgrades, and even card sleeves. Roxley’s Iron Clays – If metal coins aren’t your style, you might consider something more along the lines of Roxley’s Iron Clays. This magnificent poker-style currency was designed to coincide with Roxley’s Kickstarter campaign for Martin Wallace’s Brass. You can pre-order a set of Iron Clays or keep your eyes peeled for their upcoming Kickstarter campaign for the second printing. 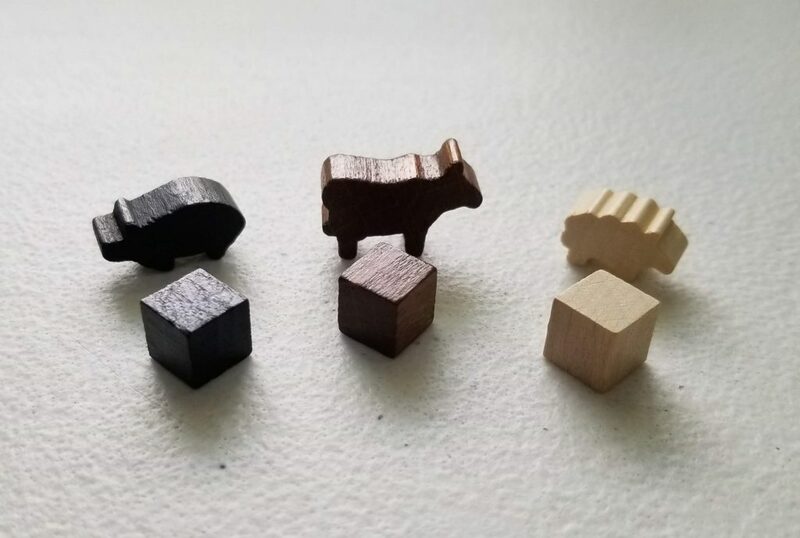 If you’ve ever played a eurogame like Agricola, you’ve undoubtedly held a wooden cube in your hand while being told to imagine that this cube represents a sheep, or that brown cube over there represents lumber. Oh, and this black cube? That’s supposed to be a boar. In other games, you’re presented with generic wooden meeples and expected to imagine that some of them are farmers while others are bankers and others are rocket scientists. If you’re a visual person, you might find it difficult to lose yourself in a board game’s narrative when playing with resource tokens and meeples that look nothing like what they are supposed to represent. Lucky for you, the following companies have got you covered. 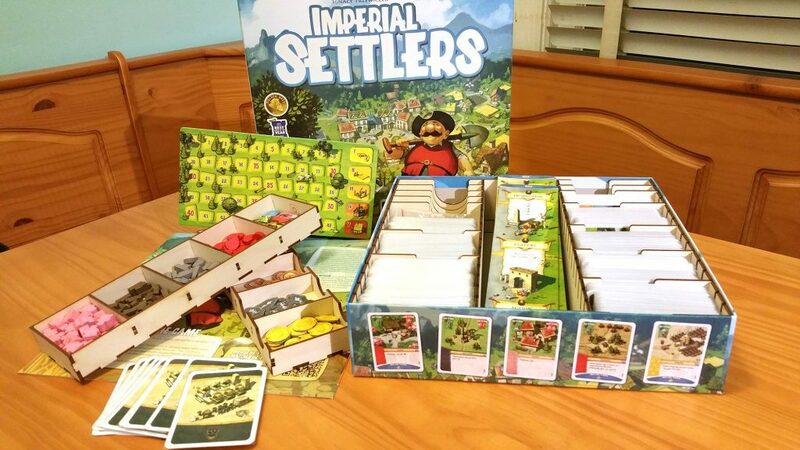 Stonemaier Games – best known for their games like Scythe, Viticulture, and Charterstone, Stonemaier Games is also well known for its line of realistic resource tokens. These tokens are pretty generic and they’re only sold in sets, but there’s no denying that they look great. Have a look for yourself and see if you don’t agree. Meeplesource – Meeplesource originally began as a company that crafted custom character meeples, but they have since branched out into other fields including the metal coins mentioned earlier as well as a line of premium resources. While not as detailed as the resources sold by Stonemaier, Meeplesource’s premium resources have the advantage of being sold separately. 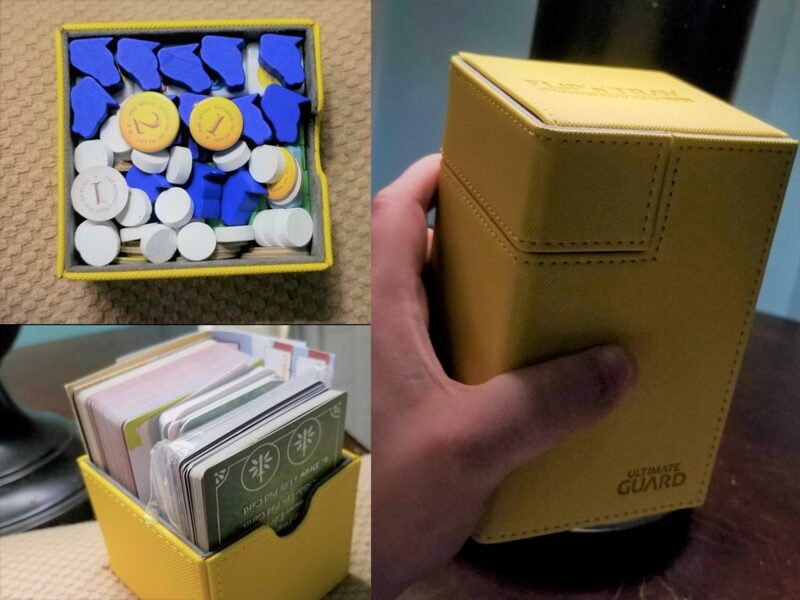 The Game Crafter – The Game Crafter is designed specifically as a site where anybody can create a game and have it produced using a wide array of available materials – tokens, chits, miniatures, dice, cards, game boards, boxes, rule books, etc. – and then put their creations up for sale on the site’s marketplace. It’s an ingenious idea and wildly successful. If you’re looking for any type of component upgrade, chances are you’ll find it here. While not the greatest quality, the prices are usually fairly low and for the budget conscious consumer, that can sometimes make all the difference. 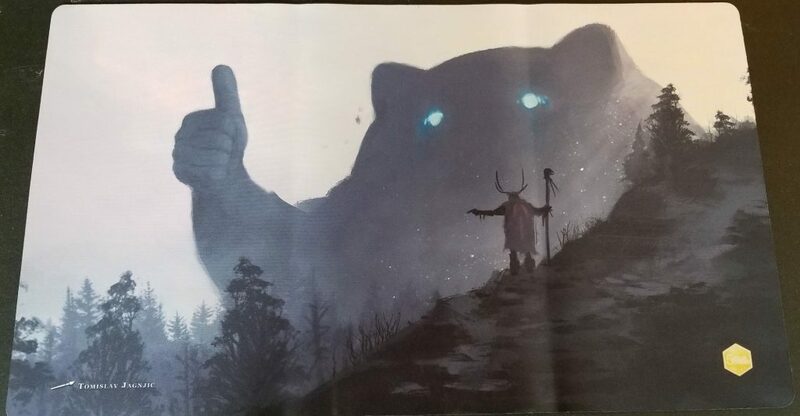 One of the most requested add-ons to a lot of board game Kickstarter campaigns are playmats. While having a playmat for a specific game is super cool and definitely helps keep things organized, it’s just not a viable solution to have a separate playmat for each and every game in your collection. So, why not go for a more optimal, all encompassing solution instead? 24” x 14” – Each of these playmats is gorgeously illustrated with a custom graphic. Each tile measures 1 foot by 1 foot and come in packages of 9. 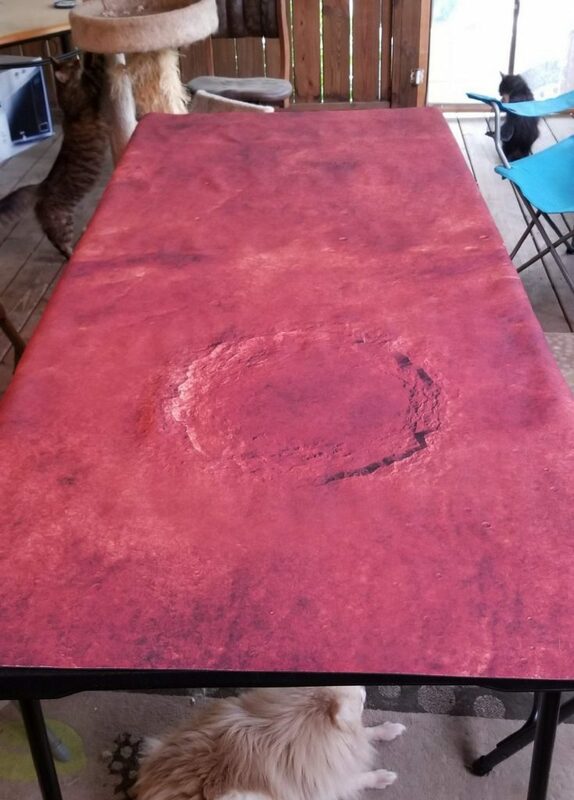 Pictured is the Mars 1 playmat. … if you look hard enough, you’re bound to find a playmat that not only fits your space, but fits your style as well. 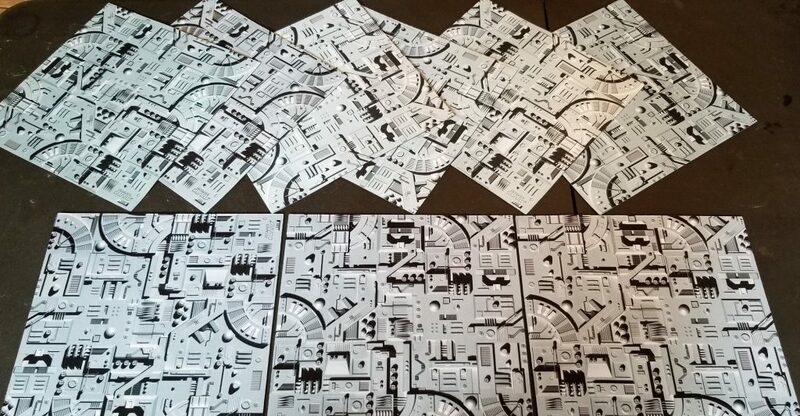 Typically, the larger the playmat, the better since a larger playmat can accommodate a bigger selection of games. However, a larger playmat also takes up more storage space, so that’s definitely something you’d want to consider. Meeple Realty also supports a wide variety of games. Their inserts tend to be more thematic in nature than most other companies and offer a nice balance between function and form. However, this also tends to mean that they are priced slightly higher as a result. Just compare the organizers for Terraforming Mars from Meeple Realty and the Broken Token and you’ll see what we mean. Go7 Gaming is another company that supports a variety of different games. 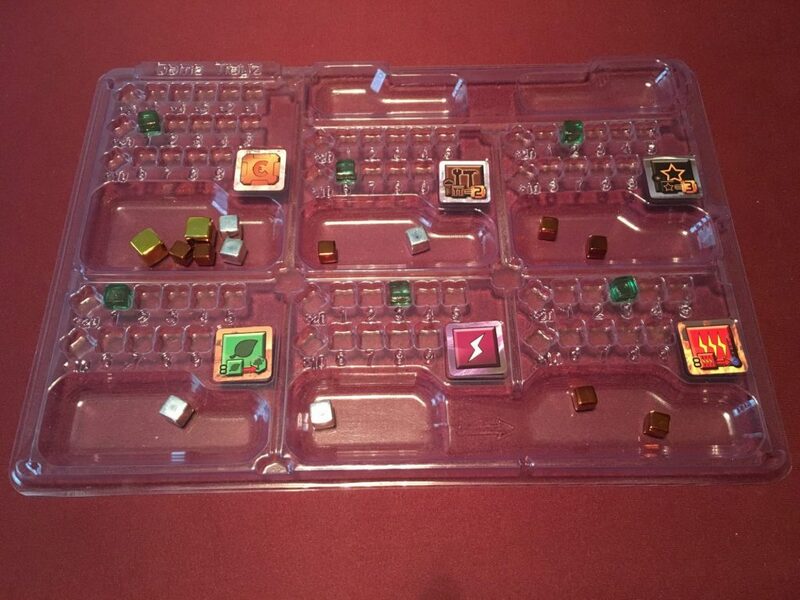 Additionally, they also offer generic “bit boxes” that you can mix and match in any way you’d like. If the game you’re wanting to organize isn’t listed, chances are they’ve got the bit boxes you need to design your own storage solution. Game Trayz has offerings that are a bit different. Firstly, while the other companies we’ve already mentioned tend to lean towards wooden inserts, Game Trayz uses plastic. Additionally, Game Trayz are designed for more than just storage. They’re designed to be used during gameplay. While they don’t come close to offering the number of solutions as other companies offer, what they do offer is of top notch quality and unique. Basically Wooden also offers a variety of storage solutions for your games. Unlike the other organizers you might be familiar with, Basically Wooden’s offerings are actual replacements for the original packaging that the games come in. If that’s something that doesn’t bother you, definitely take a look at their products. Etsy is another great place to find game organizers. Finding that perfect organizer, though, is going to require some hunting. Since each of these are sold by unique vendors, there’s no real easy way to catalogue everything that’s available. These organizers are usually less expensive than their more well-known competitors. Definitely give the sellers on Etsy a look! In summation, having the right insert not only saves you time, but it also saves space by allowing you to get rid of all those expansion boxes. That becomes particularly important when considered alongside the next item on our list. IKEA Kallax is by far the most popular shelving solution among board game enthusiasts. They are sold in a variety of arrangements with a wide array of attachments so that you can customize them to fit your style and your space. For instance, there are attachments to add doors, mini-shelves, and drawers (or even a mixture of these). Each cube comfortably holds the equivalent of four Ticket to Ride sized games. Better Homes and Gardens Cube Organizer is a cheaper alternative to the Kallax shelves. They look nearly identical, but they’re not as customizable as the Kallax shelves. Still, if you’re looking for a decent shelving solution and running on a tight budget, these might be precisely what you’re looking for. BoxThrone is the new kid on the block. It was originally launched as a Kickstarter campaign in 2017. Unlike the previous two solutions on this list which are primarily designed to be used as bookshelves, BoxThrone was conceived as a shelving solution specifically designed for board games. 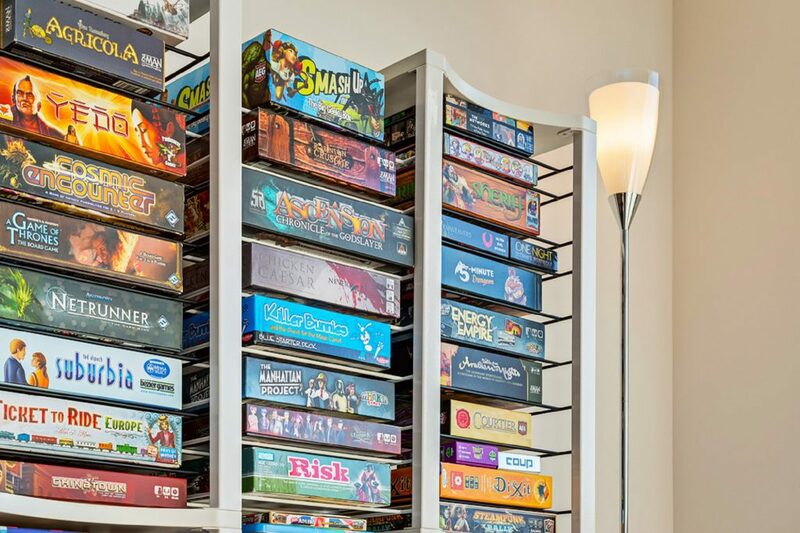 Whereas other shelving solutions force you to store your games vertically or horizontally in stacks, BoxThrone offers a modular shelving solution designed to store each game horizontally on its own separate shelf. While not available for purchase at the moment, it has been confirmed that BoxThrone will become available for retail purchase from their website in August of 2018. Wireframe shelves are another excellent shelving solution for the budget conscious consumer. They’re not pretty by any means, but they do get the job done. Since there are a large number of different manufacturers out there, they come in a wide array of different sizes and price ranges. If you just want a place to put your games and you don’t mind the industrial look, this might be the solution for you. Having the right shelving for your burgeoning game collection is incredibly useful, but can also get rather expensive. However, it’s a small pittance compared to our last and final item. If you’ve ever watched a review on The Dice Tower, you’ve no doubt marveled at the majesty of one of Tom Vasel’s game tables. The tables have changed throughout the years, but the one consistent thing about them is the high quality and loving craftsmanship. But you don’t have to be a high profile game reviewer to enjoy this luxury. You, too, can own one of these masterpieces – for a price. A good gaming table will probably be one of the most expensive pieces of furniture you’ll ever purchase in your lifetime. 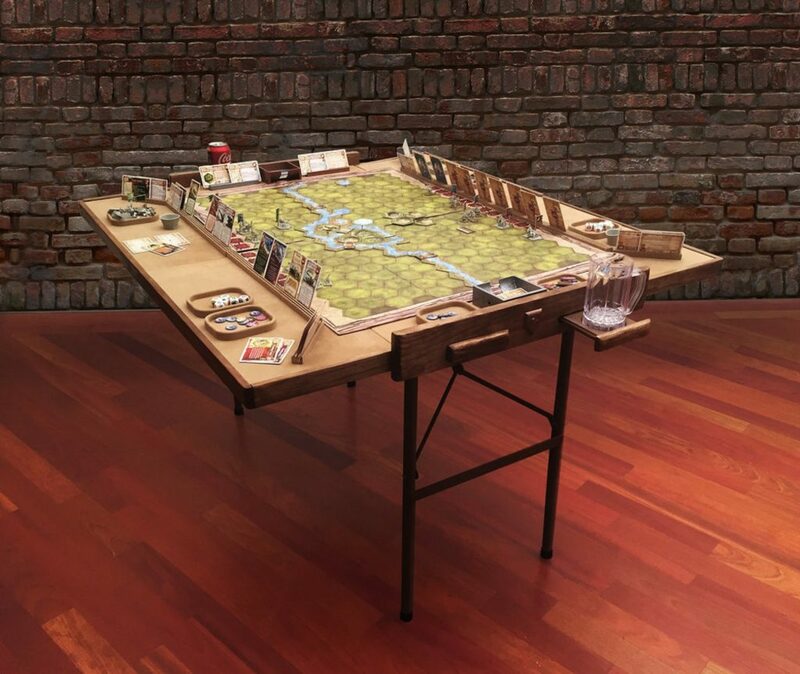 But if you’ve got the desire and the wherewithal, there’s nothing like a gorgeous game table to elevate your gaming experience to the next level. The following are some of the best offerings out there. We’ve even included a few budget-conscious options for you as well. 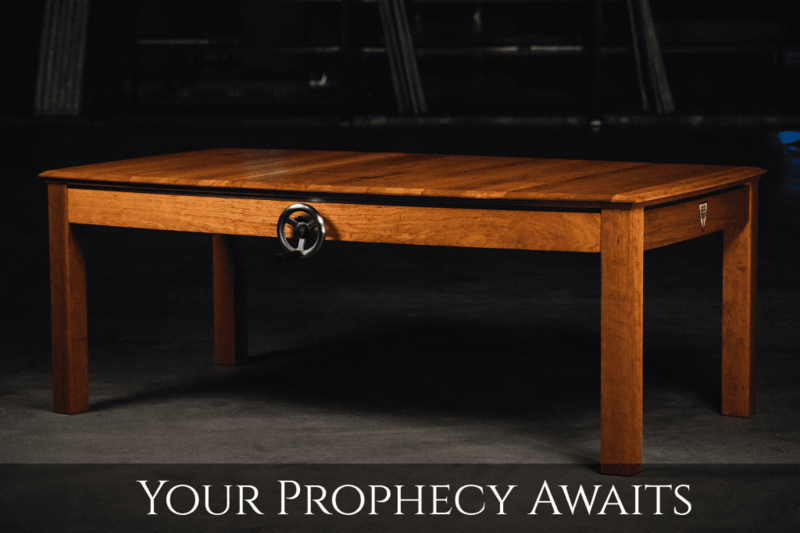 Specifically the Wyrmwood Prophecy table. 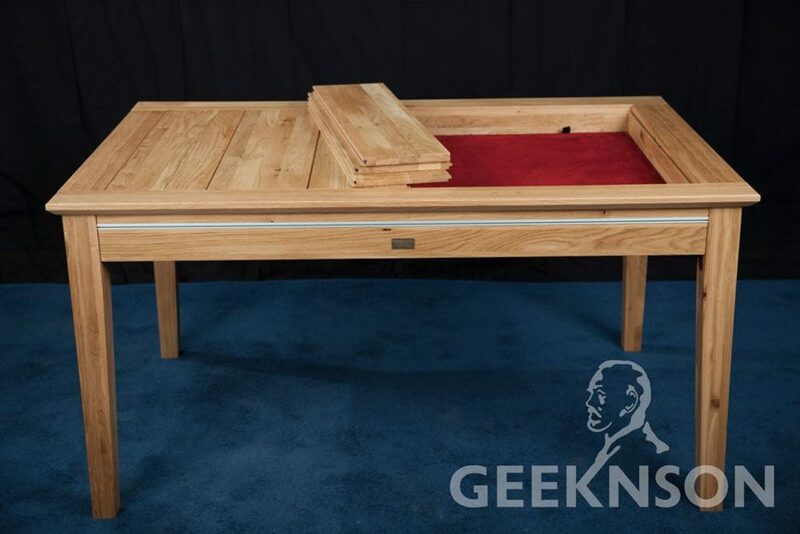 Whereas most gaming tables primarily feature a recessed gaming area with table leafs that can be laid across it, the Prophecy table comes with an option for a hand-operated crank that will raise or lower the inner gaming area to suit your needs. This table is truly a work of art! Based out of Greece, this company offers several models in different shapes and sizes. From the coffee table sized Garrison model to the massive Phalanx, each table is a well-crafted thing of beauty. 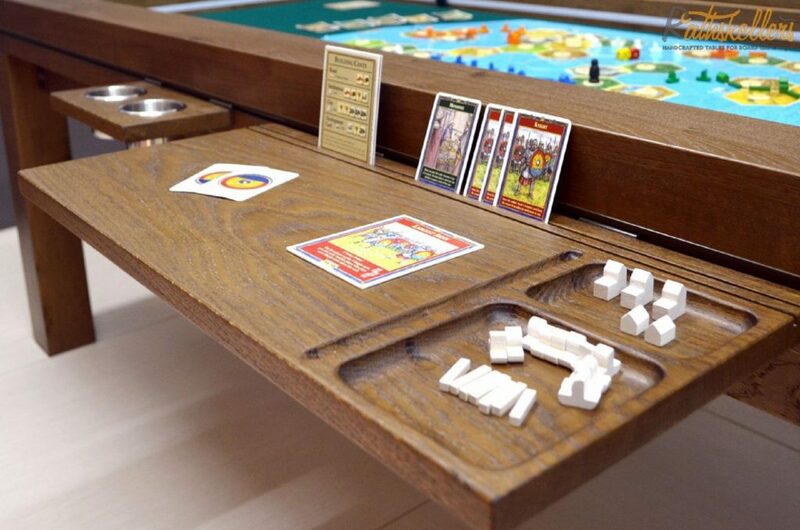 Boardgametables offers a lot of customizable features to help your gaming space truly stand apart. The basic 3’ x 3’ offering starts around $1,500 pre-tax and goes up from there as different features are added. Sturdy and durable, these tables are built to last. Geeknson offers several different models in different shapes, sizes, and with a wide variety of customization options. Geeknson’s tables are an exercise in elegant simplicity. As far as full-fledged tables go, this company’s creations are probably the most budget-friendly on this list. That doesn’t mean they’re cheap, though. These tables will still run you in the $500+ range. That price goes up the more that you customize the table as well. And speaking of customization, these tables are also some of the most customizable. I mean, just look at that photo! These highly customizable tables are designed to go portable. That’s right. These tables travel with you! Each table folds up into its own carrying case. This foldable, modular design, though, means that some of the form is sacrificed to the function. 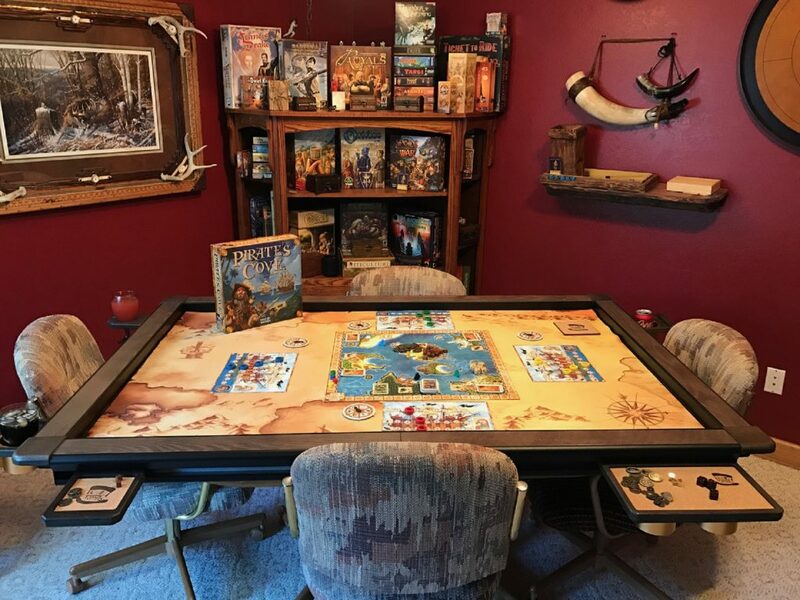 While not as eye-catching as the other tables on this list, there’s no denying that being able to travel with your gaming table is kind of cool. Maybe you’re like me and you haven’t got a college fund lying around to drop on a gaming table or maybe you simply don’t have the space, but you’d still like that ability to play your games on a quality game surface. If that’s the case, look no further than Game Toppers, LLC. These toppers are designed to sit on top of whatever table you’ve got handy and they look amazing. The best thing is, they’re just a fraction of the price of a full-fledged table. Like we said, when it comes to game tables, you can expect to spend a good chunk of change. There’s no getting around that. 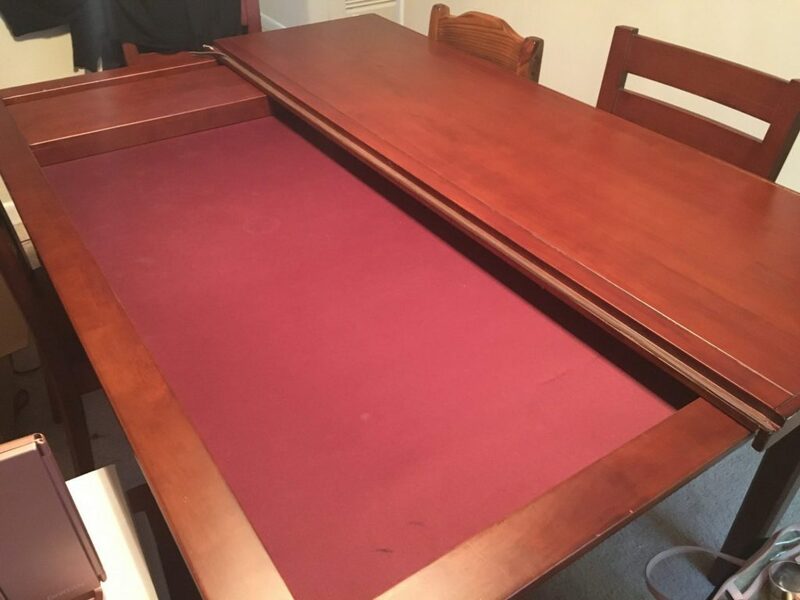 But a good game table is definitely worth the investment if you can swing it. While putting this list together, we came across a few other items we think you might be interested in that didn’t really fit into the other categories. Gamestax’s Uberstax – Uberstax are a modular board game bit holding solution. 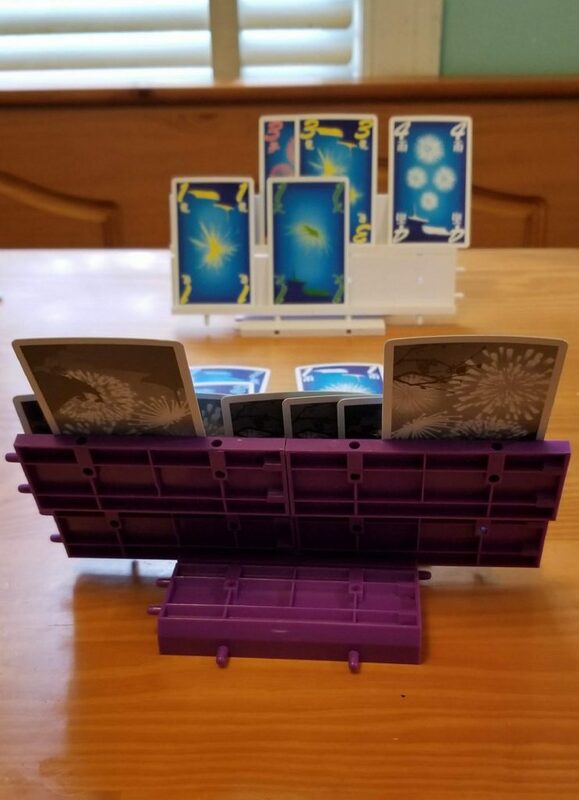 Perfect for card games, dominoes, and many other things Uberstax are a very cool add-on for any gamer’s collection. We find Uberstax particularly useful for playing games like Hanabi where being able to organize the information you have gleaned is of the utmost importance. This is definitely an item worth checking out! Ultimate Guard’s Flip’n’Tray – We’re not going to lie, this is one of the coolest things we have ever seen. The Flip’n’Tray was originally designed to store and carry collectible card game decks around but, used cleverly, it definitely has its uses for board gaming, too! The bottom section is perfect for holding micro-games and the slide out drawer is great for holding dice, chits, and smaller components. Shown in the image below are 7 games – Sundae Split, Balloon Pop, Mint Works, Bullfrogs (components for 2 players), Coin Age, Dome Crushers, and Circle the Wagons. 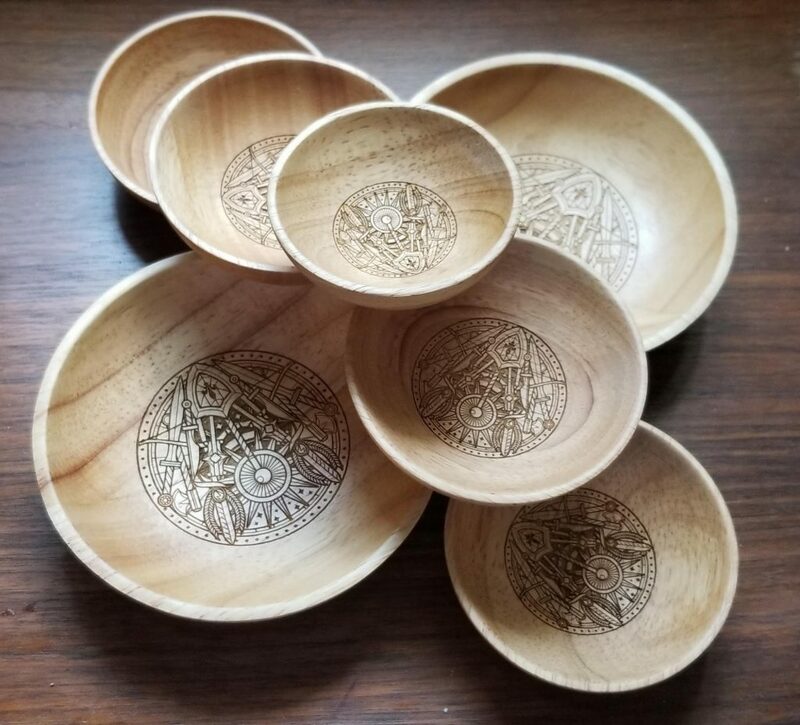 Board Games Bowls from boardgamebowls.com – These gorgeous bowls are designed specifically for the purpose of holding your game bits. Each bowl is hand turned from rubber wood which makes each bowl unique. Functional and stylish, these bowls are an excellent addition to any serious gamer’s arsenal. They’re available for pre-order on their site now. From low-budget to big-budget, there are myriad ways of taking your gaming experience up a notch. Hopefully we’ve given you a few ideas! If we forgot something, please share it in the comments below! This was a great write up. It was really thorough and didn’t play favorites the way some articles do. Great job.